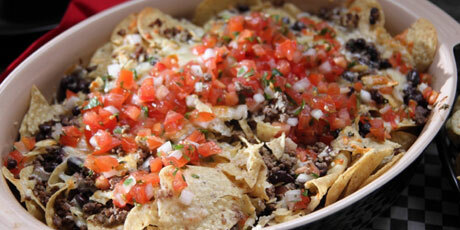 These nachos are loaded with ground beef, spices, tortilla chips, cheese, avocados and black beans. 2. In a large saute pan over medium-high heat, add the ground beef, salt, pepper, cayenne, cumin, garlic powder and onion powder. Using the back of a wooden spoon, break up the beef into small bits and cook until browned, 5 to 8 minutes. 3. Set aside a handful of the tortilla chips for sprinkling on top of the nachos, then layer half of the remaining chips in a large baking dish. Layer half of the beef, followed by half of the black beans and then half of the Cheddar and Monterey Jack cheese. Repeat the layering process 1 more time to create 2 layers. Crush the reserved tortilla chips and sprinkle on top for some crunch. 4. Bake until the cheese is melted, about 20 minutes. Serve with the sour cream, queso fresco, diced avocado, hot pepper sauce and pico de gallo for topping.